It’s a bit of a special week this week for the food team as our first intervention tests have gone live in Tower Hamlets. Shift is developing a social venture that can support fast food outlets across the UK to continuously improve the healthiness of their offerings. We want to consistently remove calories from their meals whilst maintaining customer acceptability, sales and profitability. We are working closely with owners and operators in Tower Hamlets, Birmingham and Hackney to develop and test possible changes to raw ingredients, recipes and preparation methods. This week four interventions have gone live, and we are now monitoring to see their uptake. This intervention is about taking an existing grilled (healthiest than most items on the menu) meal and giving it a new name to attract attention and producing posters to promote it. 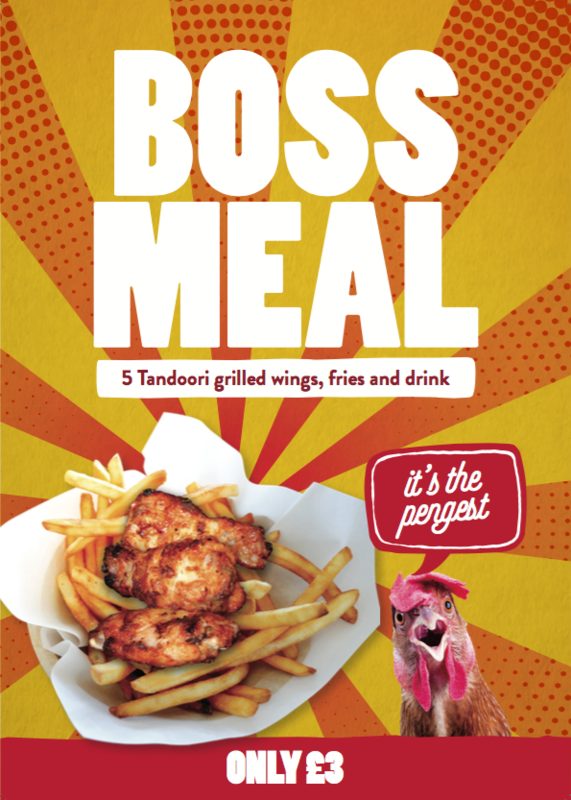 This poster is for a fried chicken shop we’re working with (boss man being the name for a chicken shop owner), and is inspired by the Chicken Connoisseur’s excellent Pengest Munch reviews. We’ll be seeing whether this intervention can help increase sales of the shop’s grilled wing meal versus their fried chicken meals. And here’s the poster we’ve done for a very busy greasy spoon caff. 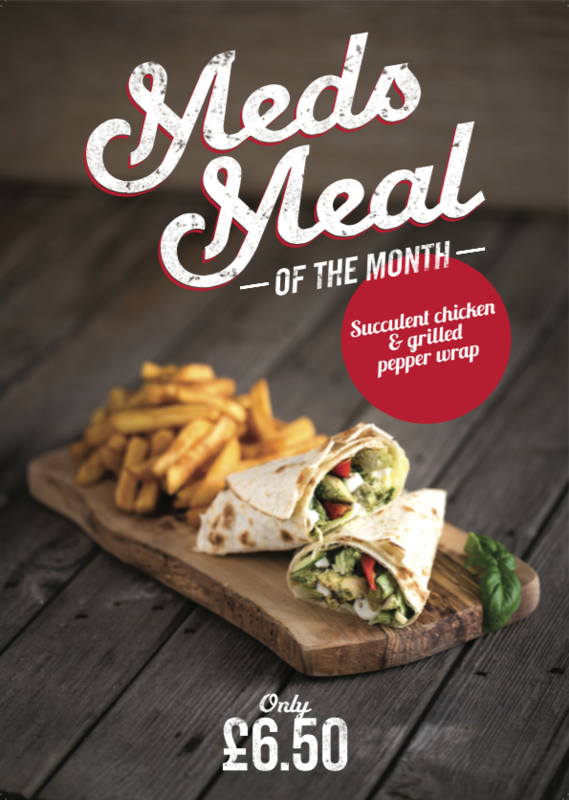 We’re testing whether rebranding their chicken & pepper wrap as the Meds Meal of the Month helps increase its sales. The owner wanted something a bit more ‘fancy’ than the boss meal to attract the instagramming students from nearby Queen Mary’s, hence the rather tasteful & aspirational wooden platter. 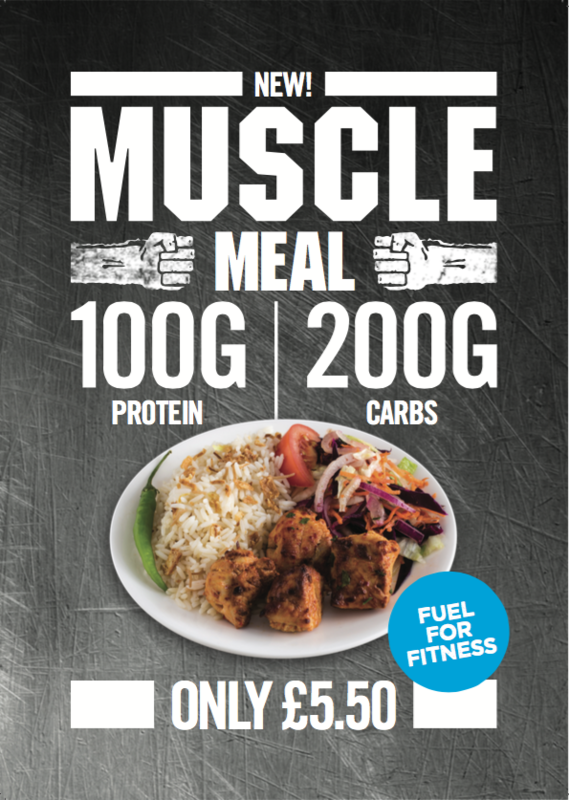 In a nearby kebab shop we’ve launched the ‘Muscle Meal’ which is a chicken shish optimised for post gym workouts (we’ve cut out the bread, and changed the chicken vs rice ratios). There’s a big gym in the area and guys will eat fried chicken after their workouts so we’re hoping that offering a muscle meal of grilled chicken will tempt them away from the fried! Our next intervention is a stealthy chip box. Stealthy because it has been redesigned to distract attention away from the 20% reduction we’re making in chip portion size. Currently a lot of chips get thrown away uneaten by customers because there’s been a race among competing outlets to make their portion sizes as big as possible – and we’ll helping the outlet save a bit of money as well. 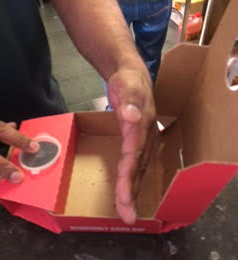 (Left) The chicken shop owner shows how much smaller we could make the box without customers noticing. When designing these interventions it’s so important to get the outlet owners involved because they know their customers the best (and it motivates them to implement the interventions if they’ve been involved in their design). Let’s see how successful we are or if we end up ‘creating world war 3’ – which is what one shop owner said will happen if customers find out we’ve made a small reduction in their portion sizes! And last but not least. the easiest/simplest intervention is adding a little icon next to healthier (or at least less unhealthy) menu items. Here’s an example of the hearts we’ve put on one outlet’s menu, we’re putting little Facebook style thumbs up on another outlet’s menu. The point is that they’re so subtle they unconsciously influence customer decision making. We are monitoring the effect of these interventions on sales in the outlets and will be able to compare data to a control period already completed. Email chris.holmes@shiftdesign.org.uk if you are working in this area and are interested in our work. UPDATE: Read the final insights report here. By Chloe | May 4, 2017 This entry was posted in Design Thinking, Poor diets. Bookmark the permalink.